On a warm April evening in 2004, I was standing in front of The Arrow on 6th Street, talking to my friend, Jim. The sun was setting as we talked, and as the sky grew darker I saw that I could get a shot of the waxing moon while the last rays of sunlight were still visible. What appeals to me about this particular image is its simplicity — just the dark roofline of the Hillsdale, faintly highlighted by the last, red rays of sunlight, and the moon in a clear, ultramarine sky. HOTEL VERONA – 317 LEAVENWORTH ST.
(formerly Rosslyn Hotel, later Burbank Hotel) c.1910. Designer unknown. 6 stories, Flemish bond brick & galvanized iron facade, beamed lobby. Some of the earliest photographs I took were nighttime shots of neon signage in the neighborhood. 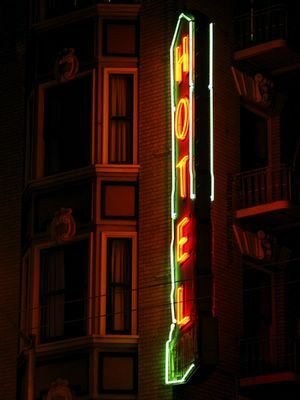 At that time the number of Tenderloin hotels with working neon signs came to five, including the Verona. 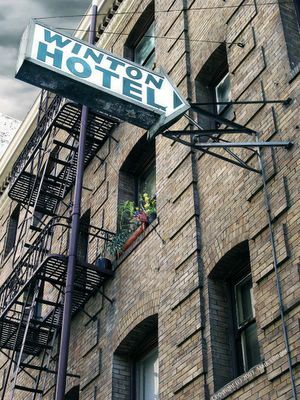 Although the Verona is technically a tourist hotel and not a residential hotel, its neon sign is entirely at home with the other signs in the neighborhood. HOTEL ELM – 364 EDDY ST. 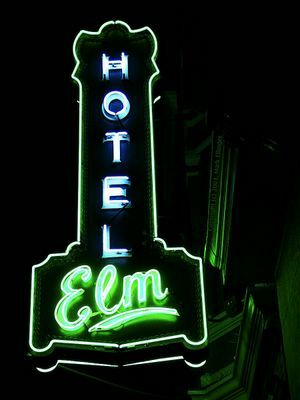 The Elm was one of the first hotels in the Tenderloin to completely restore its neon sign. The sign had been reinstalled just days before I took this photograph, so it was absolutely pristine. The dark blue aura surrounding the tubes spelling out "HOTEL" shows that the tubes are brand-new. As white tubes age they tend to get yellow, so that blue — so dark it is nearly indigo — tells a little story of its own. 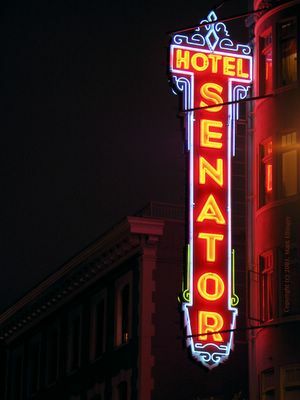 The Senator's neon sign is a masterpiece of sign-making art, although I wouldn't want to live in any of the rooms that are near it. 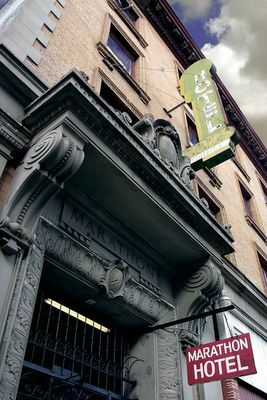 WINTON HOTEL – 445 O’FARRELL ST.
1907. Designer unknown. 4 stories, brick facade. The Winton Hotel has what I like to call "SRO windows", meaning the type of slightly arched windows that were used in brick structures erected during the late-19th and early-20th Centuries. The reason for this shape is that the outer brick walls are partial-load bearing and therefore very thick, which means they must also support their own ponderous weight. The arches distribute stress and keep the window openings from caving in. It is a wonderful example of form being derived from function. SUNNYSIDE & MINNA LEE HOTELS – 135 & 149 6TH ST. The symmetrical, box-like components of a cornice are called dentils. While their size and shape may vary, they are always symmetrical and look like long rows of evenly spaced teeth, from which their name is derived. PACIFIC BAY INN – 520 JONES ST. There are hundreds of hotels and apartment buildings in San Francisco that have design details fashioned from metal, intended to create the illusion of carved stone. 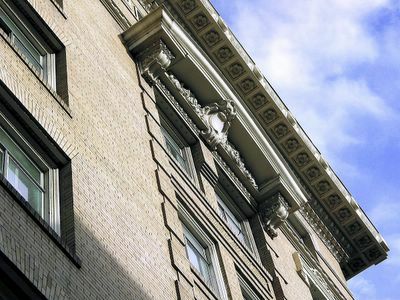 The Pacific Bay Inn's facade incorporates patterns in the brickwork that effectively compliment the metalwork, lending the building an air of quiet, Edwardian elegance. 6th Street these days is undergoing growth pains, the outcome of which will have a deep and lasting effect on many lives. I am not sure what saddens me more: the continuing marginalization of the people who live in this neighborhood, or the disappearance of some of the last remaining vestiges of this city’s working-class history. I have witnessed in dismay the destruction and burial of entire chapters of San Francisco’s history since I first came here in 1968. I am not opposed to change — it is nearly the only thing of which we can be certain in life. What I oppose is wanton destruction in the name of the almighty dollar. My hope is that by sharing these photographs of buildings that I love, this small but important piece of history will live on, despite the blindly onrushing forces of our time. 6th Street, looking south from the sidewalk in front of the Whitaker Hotel, c. 1950.